About a year ago, I reviewed Allen Say's autobiographical work Drawing from Memory and the effect World War II had on his life growing up in Yokohama, Japan. 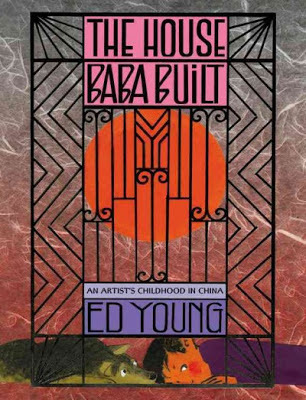 Ed Young's The House Baba Built is also an autobiographical work and describes his life in Shanghai, China during the war. Ed Young's father was an engineer and realizing that war was coming to China, he decided he needed a safe place for himself, his wife and five children to live in. The safest place would be around the foreign embassies in Shanghai, known as the International Settlement. But land there was expensive and so Baba (an affectionate term for father) made a deal with a landowner - Baba would built a house on his land with the proviso that his family could live in it for 20 years. The family moved into the house in 1935 and for the first few years that they lived in Baba's house, life was good. There was a lovely swimming pool, where friends and family would gather in summer, there was lots of pretend playing, lovely gardens and even a roof that made a great roller skating area. Life wasn't rich in goods, but it was rich in so many other ways. But when the Japanese invaded Nanking in 1937, Baba had to build an apartment where the kids roller skated because relatives from there had escaped to Shanghai to live. After that, the effects of the war began to be felt more and more. And in 1940 a family who had escaped Hitler's Germany, the Luedeckes, also moved into Baba's house. The three families living in Baba's house were very fortunate. Even after things changed with the bombing of Pearl Harbor and the loss of British and American protection, the house that Baba built was able to withstand the war, and even when bombs were being dropped directly on Shanghai, they missed the house completely. When the 20 years were up, the Young family honored their contract and turned the house over to the landowner. By then, most of the children had grown, married and gone their own way. It was during the war, living in Baba's house, that Young discovered his talent as an artist. Given crayons and paper to use while recovering from a cold, his first attempt at drawing was a cowboy that didn't quite match what was in his mind. But he sought guidance and the rest is history. For The House Baba Built, he used a mixed media, which gives it depth and texture. Young's family is shown in an interesting combination of old photographs and drawings, there are all kinds of collages (my favorite art form), and some of the pages fold out to reveal even more of the life of the Young family in Baba's house. 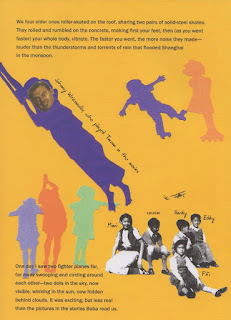 Most of the book consists of vignettes that are put together to resemble the collages, rather than a linear history of Young's early life. However, there is a timeline at the end which can help orient the reader if needed. And there is an extended section at the end of the book of later photographs, including Baba's house, as well as a diagram of the house and some facts regarding how the house was built to bombproof it. All in all, The House Baba Built is an interesting book for all kinds of readers, but especially a reader who likes to explore each and every page of an illustrated book. This is a work that proves itself to be an insightful look at some of the early influences on a beloved author/illustrator. Sounds like a fascinating book. I read one or two books about WWII Shanghai (my interest stems from my great-grandfather who was a refugee there and his business still operates) and found them all to be very interesting. I can see why you would be interested in this. That is so interesting about your grandfather's business. I was just given a YA novel about refugees in Shanghai, an area I have been wanting to explore for a while. This sounds like an intriguing read! It is a different book with a unique style. Thanks for your review and for sharing it with us. It sounds like a book I coils learn a lot from. This is a good book, it is always interesting to see when a love of art began for an artist and Ed Young is a favorite of mine. My son is into WWII right now, this will be a perfect read for him. Thanks for sharing !! I love Ed Young and I enjoyed this book very much. Glad to have found your blog on the Mother Reader challenge. I am inexcusably late hopping this round! On the bright side, I'll remind everyone of the new Hop this coming Wed. :) This book sounds like a wonderful history lesson. Thanks for including it in the hop! See you soon in Wed.'s hop!